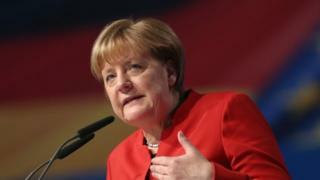 Mrs Merkel's comments drew thunderous applause from her party faithful but it will dismay those who have looked to her as Europe's defender of liberal values. And this is also about timing. Tuesday's speech in effect sets out the CDU stall ahead of next year's general election. Mrs Merkel's conservatives, like other established parties, are losing votes to the AfD. Even she admits this will be the toughest election she has ever fought. In German culture, she said, it was not appropriate for women to completely cover their faces and the full veil "should be banned wherever it is legally possible". The BBC's Jenny Hill says it is the first time that the chancellor has made such comments in a major speech. In recent months, the Alternative fur Deutschland (AfD) has capitalised on a wave of anger over last year's migrant crisis, and made strong gains in regional elections. In France - where the full-face veil has been banned in all public places since 2010 - the far-right National Front (FN) is credited with 30% support ahead of a presidential poll.